Following the outbreak of the First World War, the Canadian Minister of Militia and Defence discarded the existing mobilization plan. 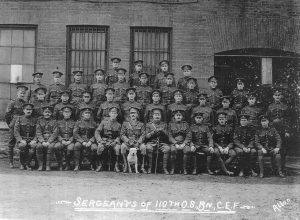 Therefore men of the 28th Perth Battalion were sent to various other battalions in Ontario. 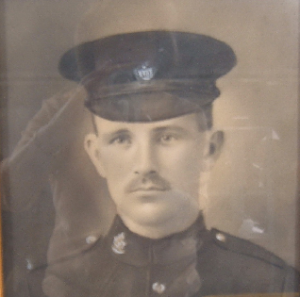 By estimate, 4,000 men of the Perth County fought during the war. The 110th Regiment was awarded a primary battle honor for their role in the Battle of Ypres when poison gas was used in a surprise attack. À la suite du déclenchement de la Première Guerre mondiale, le ministre canadien de la Milice et de la Défense avait rejeté le plan existant de la mobilisation. Donc, la majorité des hommes du 28e Bataillon Perth étaient envoyés à une variété d’autres bataillons en Ontario. Par estimation, 4,000 hommes du comté Perth se sont battus pendant la guerre. Le 28e régiment a été décerné avec un honneur de bataille primaire pour son rôle dans la bataille d’Ypres quand le gaz toxique était utilisé dans une attaque-surprise. Alexander Barclay enlisted on February 22, 1916. Serving with the 58th Battalion in France, Barclay was hit with a bullet in the leg. During the battle of Paschendale, Barclay was reported missing in action and later presumed to have died. His burial place is at the Menin Gate (Ypres) Memorial in Belgium. He was 33 when he died. He left his wife Maria Barclay and their daughter at their home on 288 Nile Street, Stratford.